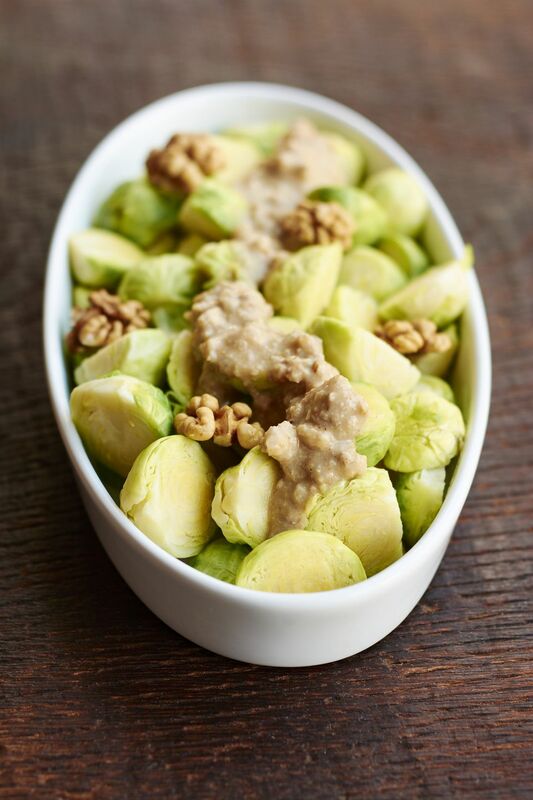 Brussels sprouts are sauteed to bring out their nutty flavor and then mixed with walnuts for a simple fall or winter side dish in this quick, ultra-healthful recipe. This dish is good hot or warm, and can be kept warm for up to an hour by simply covering it with foil and setting aside in a warm kitchen. Since the recipe is also easy to double or triple, it makes a great addition to the holiday table. Trim off and discard the ends of the brussels sprouts. Pull off the darker outer leaves. Cut larger brussels sprouts in half or quarters, leaving only the smallest, tenderest sprouts whole. You want all the sprouts or cut sprouts to be about the same size so they cook evenly. Set aside the trimmed, prepped sprouts. Heat a large frying pan or saute pan over medium-high heat. Add the walnuts to the dry, hot pan and cook, stirring frequently, until they're starting to toast, about 3 minutes. They will continue toasting after you take them off the heat, so remove them before they're as dark as you'd like them. Transfer the walnuts to a dish and set aside. Return the pan to medium-high heat and melt the butter or heat the oil. Swirl the pan to coat the bottom with the butter or oil. Add the Brussels sprouts, salt, and 1/2 cup water. Bring to a boil, cover, reduce the heat to a gentle but steady simmer and cook, undisturbed, until the Brussels sprouts are bright green and tender almost all the way through, 3 to 5 minutes depending on the size of the sprouts. Uncover and continue to cook, stirring frequently, until the Brussels sprouts are tender and starting to brown, about 3 minutes. The water should all be evaporated at that point as well. Add the walnuts and stir to combine. Transfer the brussels sprouts to a serving dish and drizzle with walnut oil, if you like. Serve hot or warm. Cover loosely with foil to keep warm for up to an hour, if desired. If holding warm, wait until serving to drizzle on the walnut oil. Walnut oil and toasted walnut oil both add tremendous flavor, and are particularly well suited to earthy, nutty dishes. Like all oils, they don't last forever, and like most nut oils, they have a shorter shelf-life than many people may think. Buy high-quality oils from stores or vendors with high turnover (you don't want a bottle of walnut oil that's been sitting on a shelf for a few years!) and store opened bottles in the fridge. Always smell nut oils before using them—they should smell like the nuts they came from. If you catch a slightly off smell, the oil has gone rancid and should be discarded.